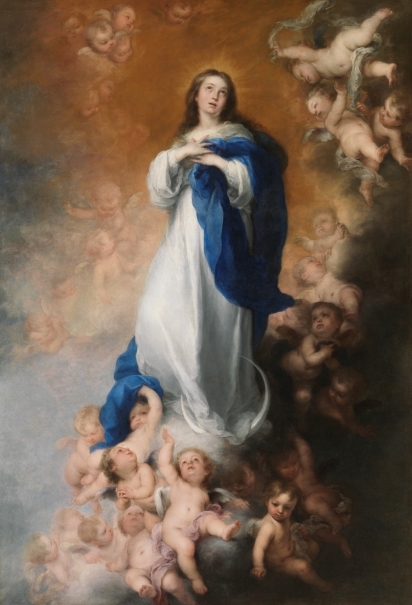 Murillo created a highly successful formula for representing the Immaculate Conception, with the Virgin dressed in blue and white, her hands crossed over her bosom and her gaze directed at the heavens as she stands on the moon. He presents her with a clearly upward impulse that situates her in a celestial space filled with light, clouds and angels. That was the artist’s manner of combining two different iconographic traditions: the Immaculate Conception and the Assumption. One of the finest examples is the present canvas, which was commissioned by Justino de Neve for the Hospital de los Venerables Sacerdotes in Seville. The Immaculate Conception had already been a growing object of devotion for a century and a half when this work was painted, and it eventually became one of the main collective identity traits. It was one of the most genuinely local subjects, as Spain was the leading advocate of the Immaculate Conception, and the country that most insistently fought to convert that mystery into a dogma of faith. For two centuries it was a sort of paradoxical dogma observed specifically by the Spanish, who even had to swear a vow of Conceptionist faith in order to belong to professional or municipal corporations, while its status as dogma was not established in the rest of the Catholic world until the 19th century (Portús, J.: Guía, 2001). Over the course of his career, Murillo painted around two-dozen Immaculate Conceptions, possibly more than any other Spanish painter of his time. He even created his own iconography for it, eliminating the superfluous -symbols of the litanies and of the Virgin’s purity- but maintaining the angels and the symbols of the Apocalypse, such as the crescent moon and the enveloping golden color, which symbolizes that the Virgin is dressed in sunlight. 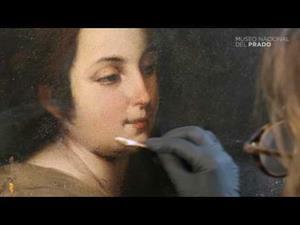 The present work differs from most of Murillo’s Immaculate Conceptions in its triumphant attitude and its considerable upward movement, as well as its absolute lack of traditional attributes. The Immaculate Conception at the Hermitage Museum has a similar iconography and the same sensation of rapid ascension and may therefore have been painted around the same time. In the present work, the absence of the Virgin’s traditional attributes -the tower of David, the sealed fountain or the palm and cypress trees- may have to do with their presence in the frame described by Torre Farfán, which is still at the Hospital. 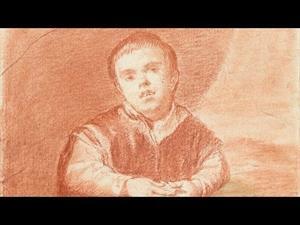 They may have been included in the frame to provide the symbolism lacking in the painting (Text drawn from Cenalmor, E. in: Murillo y Justino de Neve. El arte de la amistad, Museo Nacional del Prado, 2012, pp. 114-117). Height: 274 cm. ; Width: 190 cm. 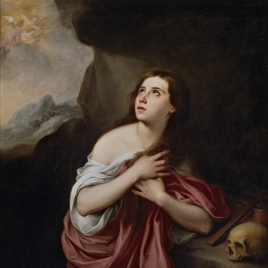 Justino de Neve Collection, Seville, 1685; acquired by the Hospital de los Venerables Sacerdotes in Seville, 1686; Alcázar in Seville, 1810; Marshal Soult Collection, Paris, 1813-1852; acquired by the Musée du Louvre, 1852; entered the Museo del Prado though an exchange with the French government, 1941.